Garage door repair in Arlington, TX, might seem simple at first. But thousands of injuries occur each year while garage doors are being worked on, or following DIY repairs. Sadly, many of these injuries affect children. Don’t put your family at risk – hire a pro for your Arlington garage door repair. It’s safer, you’ll keep your home secure, and you’ll save money in the long run. Here are the 5 things you need to look out for that mean it’s time to make the call. If the door is jammed shut or jammed open, you’ve got an obvious problem. If it moves slowly, that might be a warning that the motor is on its way out. Plus, if the door is jammed open and your garage is connected to your home, be aware that thieves love to gain access to houses via garages. It can be much less conspicuous than a window or the front door. You need to get it fixed fast. A noisy garage door is a tell-tale sign of an aging or damaged door. The noise might be happening because of obstructions in the track, or damage to the door (or tracks) that is causing metal parts to grind against each other. Over time, this will wear out the door and put the mechanism under strain. Both of which can result in dangerous doors over time. 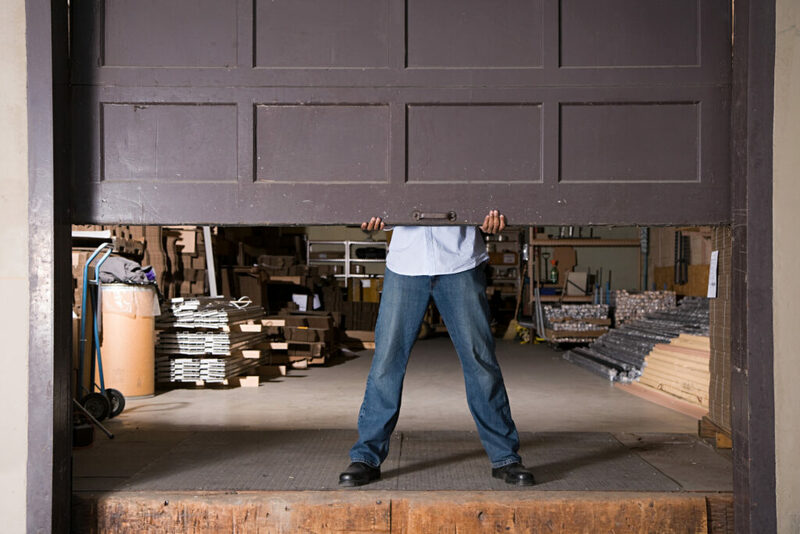 Shaky garage doors are often caused by a simple lack of lubrication, but it could be something more serious. For example, the pulleys might be pulling the door unevenly along the track, causing the door to judder as it moves. Have a professional check out the situation to understand what’s wrong. Regular maintenance is important to catch these issues early on. You should visually inspect the door every few months, keeping an eye and an ear out for shakiness and noise. If the door rollers have fallen off the tracks, do not try to guide them back by yourself. You may trap a finger – or much worse. Also, don’t try to use the door. It won’t work, and you could be causing invisible damage to the mechanism. If that needs to be replaced too, you’re looking at a much more expensive job. When you press the door control buttons, is there a delay before the door responds? If you notice this happening, the electronics might need looking at or replacing. Or you could have a problem with the motor itself. Either way, this tricky job is best left to the pros! Alamo Door specializes in garage door repair in Arlington, TX. If your garage door is looking in poor shape or you’re experiencing problems, give us a call. Commercial, residential, new installation or repair work. During our 18 years of service, we’ve seen it all and fixed it all. Whether you’re replacing your garage door or installing a new one, the process can be rather daunting. You have to muse on several issues, such as safety, material, aesthetics, cost, and size. The good thing is that you don’t have to go through that alone. With a little help, you can find the light garage door Arlington TX for you. And that’s what this post is about: to guide you. Garage doors come in different styles to suit your house’s design and exterior. If you want a door with a personal touch, then a window-paneled door is an excellent pick. You can do this by adding a row of window panes on the upper panel. There are also different panel designs to consider, such as long raised, short raised, flush, and carriage house panels. Your choice will certainly depend on your preference and design. For example, short raised panels are ideal for Victorian-style or colonial-style homes. 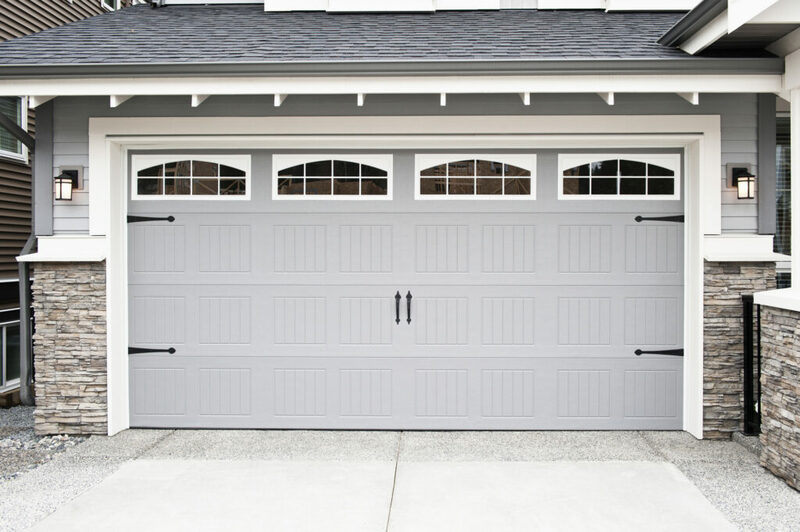 There are several materials for a garage door in Arlington TX, such as steel, wood, aluminum, wood composite, and fiberglass. Steel is the most common because it’s durable and require low maintenance. Plus, you can find it in any style you like. However, steel is a poor insulator if you’re concerned about your energy bill. Aluminum doors share several characteristics with steel. They’re cheaper and lighter than steel. They are prone to dents, though. For a traditional style, get a wood garage door. Plus, it’s available in a variety of styles to choose from. It also has better insulation than steel. Stain-grade wood doors cost more than painted wood doors. Composite garage doors are made from recycled wood fiber. They have the strength of steel and looks of wood. You can stain or paint them to suit your style. Fiberglass doors are less popular than other materials. This can be due to their poor insulation, lightweight design, and tendency to fade. However, they are a great option for coastal regions as they are resistance to salt-water corrosion. You should consider the garage door construction, especially when you want a steel door. This is because they come in 3 different options. Double layer – This door has panels of 25- or 26-gauge steel. It offers soundproofing and some insulating value. Triple layer – This is a top quality door with steel construction of at least 24 gauge. It is the most secure and soundproof steel door option. Keep in mind that the lower the gauge number, the thicker the steel. With these tips, you can proceed to pick the right garage door for your home. Be sure to pay attention to the kind of torsion springs you will use on your door. You should get one that is rated for 20,000 cycles to ensure durability. At Alamo Doors & Gates, we’re here to help you identify the right garage door Arlington TX. 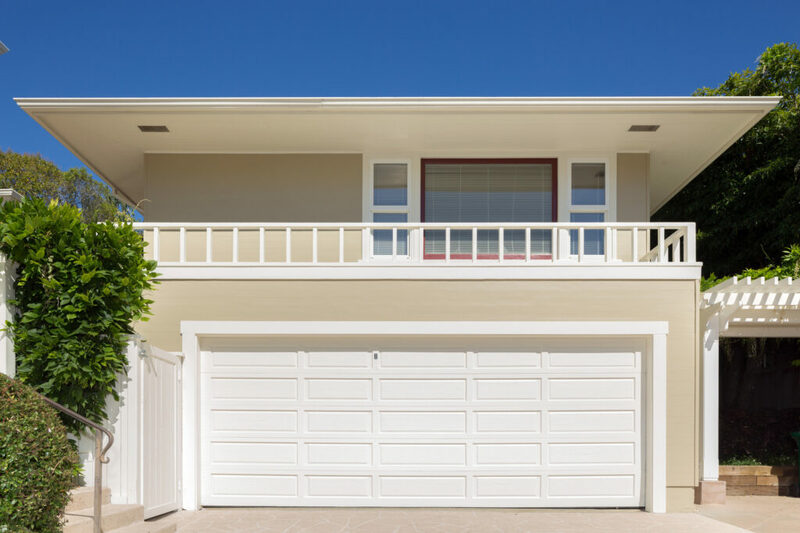 With over 18 years of experience, we’re your best bet for garage door installation and repair. Do you have any question? Feel free to reach out to us any time. Do-it-yourself projects are popular in today’s society. Whether you enjoy getting your hands dirty or are trying to save a buck, there are some serious things to consider before attempting to fix your garage door yourself. Did you know that more than 40 million people go to the ER each year due to personal injury, and 82% of them are accidents? In addition, DIY garage door repairs often result in more damage and expenses. Keep reading to find out why you should avoid doing it yourself and hire a professional for your Southlake garage door repair. All too often we see this happen. Someone tries to fix their garage door on their own and ends up with more issues than they started with. This happens for many different reasons. To start, garage doors are complex. Without extensive knowledge and training within garage door manufacturing and mechanics, it is easy to misunderstand what, or where, the issue is. Lack of knowledge can quickly turn a simple fix into a costly repair or even replacement. Not to mention a waste of time. Secondly, garage repairs need specialized tools made specifically for garage repairs. Many times people try to fix the garage door with tools they already have. Using the wrong tools can damage the door and/or opener as well as the tools themselves (we all know tools aren’t cheap). In addition, misuse of tools can lead to injuries. Garage doors are dangerous on their own. They weigh between 200 and 500 pounds and include moving parts that can entangle or catch other objects. Throw in standing on a ladder, using power tools, and taking the door apart and you’ve got a significant increase in the risk of injury or damage. Trying to fix your garage door often includes standing on ladders. This can lead to falls and relative injuries. Another hazard is the collapsing of the door itself. Tinkering with parts can cause the door or parts of the garage door system to fall. This creates risk involving the door falling on you or your personal items like your vehicle. It can also cause damage to your garage floor, too. Torsion springs and extension springs are also both highly dangerous. These are common in residential garage doors. 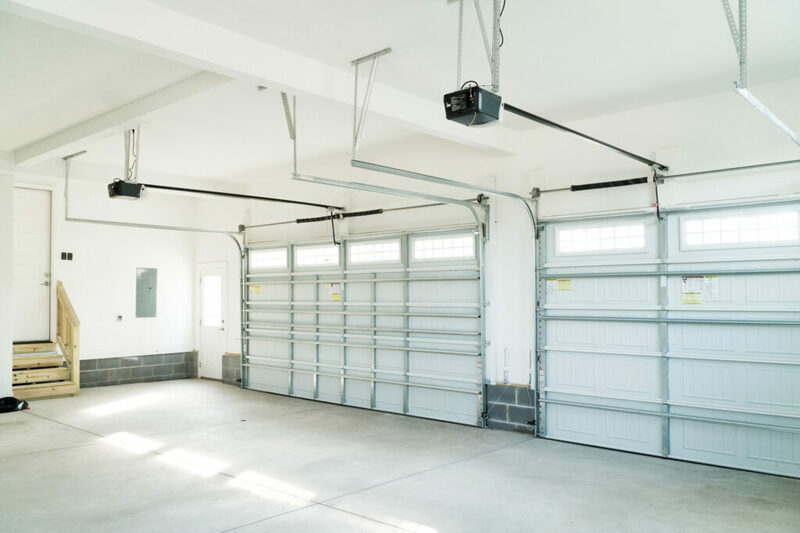 Torsion springs are mounted above the door on the ceiling of your garage and involve tightly wound parts. The design of torsion springs means there is a lot of tension placed on the part. If the spring breaks or you have cut it loose during your DIY repair, pieces could violently fly loose and injury you or your belongings. Extension springs line the sides of your garage door near the upper door track. Like torsion, they hold tension whether the door is open or closed. The strings stretch to open the door slowly and gently, leading to more tension. Disconnecting the extension cables poses the same threats — snapping, breaking, and flying pieces. If a spring snaps you, it can be life-threatening. Repairing garage door springs wrongly can result in collapsing doors and more risk of harm. Both damages to your items and injury can become costly and even fatal. Skip the risk and hire a professional for your Southlake garage door repair. Most garage door warranties require all repairs to be completed by licensed and trained garage door professionals. This means if you attempt to fix the door yourself and something goes wrong, your warranty could be stripped away. Without a warranty, the cost of repairing or replacing garage doors can get very expensive. If you have a warranty on your garage door, then there is no point in trying to fix it yourself in the first place. Your warranty will help cover some or all of the costs to have a knowledgeable technician do the job. Check with your door manufacturer to see if you have a warranty and learn about the approved technicians in your area. Purchasing a Southlake garage door repair is truly not that costly. Garage door repairs are actually one of the most affordable home repairs on the market. This is because the parts, as well as labor rates, are inexpensive. Professional garage door service providers get wholesale deals when purchasing parts. They also will already have the parts and tools necessary to implement the fix. Compare that to having to order or purchase the parts at retail value (which is much more expensive) and likely pay for shipping or delivery fees. And don’t forget to throw in the amount of time you’ll spend trying to repair the door or system and any additional damage that may arise. You can see that it is likely more economical to pay for a professional repair. Plus, it will provide you and your family peace of mind knowing that the job will get done correctly and in a timely manner. DIY garage door repairs can result in more damage (to your door and/or your stuff), injury, and increased costs. Avoid the hassle and hire us for your Southlake garage door repair. You won’t regret it. At Alamo Doors and Gate, we offer both residential and commercial garage door services for all your needs. Whether your garage door issue is structural, mechanical, or electrical, we will restore your garage door back to great condition in a timely and affordable manner. From simple dents to wiring issues, we’ve got your back. We have 18 years of experience in the Southlake and Dallas-Fortworth region. Contact us today to get a free consultation and quote. We are available 24/7 and provide same-day emergency services.